All photos in this review were taken from a pre-production version of Prêt-a-Porter,so please don’t judge the quality of the components from our photos. For the same reason we have not awarded a “Components and Design” score. Said copy was generously assembled and provided by Ignacy Trzewiczek and Portal. Thanks a lot. Update: we received a final version and scored the “Components and Design” on that. Ignacy Trzewiczek has created games in very traditional settings. Medieval soldiers engaged in a siege is a classic and make up the game Stronghold. Armies of wizards nuking it out over a ruined temple are always popular and gave rise to Witchcraft (together with Michal Oracz). 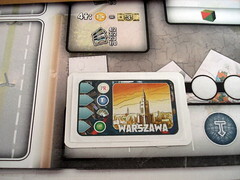 Gang wars in a post-apocalyptic future are a newer trend, one that Ignacy helped introducing to board games with 51st State. And of course, games about models high-heeling down the catwalk in clothes that no one would wear in the real world have been a staple of gaming since … oh who am I kidding here, that’s a new one. I can’t think of a single serious game that used this setting before. And next to Trzewiczek’s other games, this setting sounds so harmless, so benign. But just because no one is having their skull violently deformed in Prêt-à-Porter there is no lack of conflict here. It’s just more polite. The conflict in Prêt-à-Porter is of an economic nature, and economy is in the driver’s seat for this game. The production of garments is just a by-product. We take control of a fashion house for one year, freshly founded with $40.000 of capital and three untrained workers. The goal is to be the head honcho of the most successful company after one year, with success being measured in cash but also indirectly in success at the fashion shows. A year sounds like a lot of time, but it’s just barely enough to get anywhere. Prêt-à-Porter appears more complex at first then it actually turns out to be: you close contracts, buy buildings, hire employees, select designs and buy materials from three different sources. Fortunately, many of these actions turn out to do similar things in an only slightly different manner. That’s not a bad thing at all, Prêt-à-Porter still holds more than enough complexity to keep your mind busy and having all those elements work entirely different from each other would put the game outside of many player’s comfort zone. 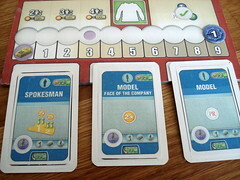 To manage your business, Prêt-à-Porter uses an action pawn system similar to the one from Dominant Species: before anyone does anything at all, players take turns placing action pawns on one of the nine available actions – all of which have limited space to place said pawns, of course – and then the actions are executed. The first action is the one you never want to take but almost certainly will at least once during the game: pick up a credit from the bank. Money just flows away in Prêt-à-Porter and especially in the beginning you may need some help covering your expenses. Taking a credit helps you over the worst troubles, but it’s not the solution to everything. Banks don’t offer money out of pure altruism, they want something in return. In this case, it’s ten percent interest per month that you have to mark on your maintenance cost track. Yep, you read this right: there are so many things to pay for every month that you get counters to push around just to keep track of your expenses – which is why you needed that credit in the first place. Next are contracts, buildings and employees. These all have the same function with only slight differences in how they work. The thing in common is that they all give you additional options to act. There are differences in what kind of options, but also a lot of overlap. Contracts, for example, may allow you to buy buildings or hire employees without placing an action pawn there, to buy materials for a better price or to sell materials again although that’s not usually possible. However, contracts expire after the next fashion show. Buildings let you do some of the same things, but they also let you pick random garment designs, adapt designs to fit a different style or increase your company’s value for a small amount of cash. Other buildings simply give you permanent trend or PR counters. Finally, employees do some of the same things again – especially adding counters – but some especially powerful employees like the Spokesman and the Journalist do much, much more than that. Buildings and employees also increase your monthly expenses and can be upgraded to make their effect more powerful for a small amount of money. After finding your little helpers, it’s time to think about creating fashion, and what you need first is patterns. Patterns belong to one of five styles – from children’s fashion to evening wear – and one of five types of garment – dresses, skirts and so on. Each company is specialised in one type and receives a free trend counter on each design of that type. Unlike just about everything else in Prêt-à-Porter, patterns are free. But to make actual clothes, you still need materials and so the next stop is the market. The next three stops, really. Materials come from local manufacturers or the warehouse or they are imported. Each option is more expensive than the previous one, but also gives you more quality counters. Apart from that, there is one crucial difference between the ways of shopping: buying from local manufacturers or importing lets you buy only one type of material with each action pawn there, but in any quantity. The warehouse, on the other hand, sells you all six kinds of material at once, but only one unit of each. All patterns need two different materials, making one-stop shopping impossible when you have more than three patterns in your collection. Finally, after all shopping is done, the last possible action is to prepare for the upcoming fashion show by picking up a PR counter, a trend counter, two quality counters or a small amount of cash. This is usually the action to take when you have no better ideas what to you with your pawn, but occasionally taking this counter just before a fashion show makes a big difference. After all the actions are done, you may now upgrade one employee and one building, increasing your monthly expenses again just before you have to pay them. After two months of this preparation, it’s time to go on the catwalk. After choosing your collection to present – garments of the same style that you have the materials to make – you send your skinny females out to show them off. Each fashion show takes place in a different city and the judges everywhere have different preferences. Some prefer bigger collections, others prefer a higher quality or more trendy designs. Each city judges in two to four categories, awarding stars to the first and sometimes to the second place. These stars, the marks of your fashion sense’s victory, may be the most important counters in the game: not only do they turn into company value before the next show, they also pay off in hard, cold cash immediately: after the fashion show, you sell your current collection for the value printed on each design, plus $1.000 for each star you won. Incidentally, if you’re employing a Spokesman every first or second place awards you two additional stars, that adds up to a lot of money over the course of the game. After 12 months – four fashion shows – you add your cash to the company value and the most successful entrepreneur is declared the winner. In your first game, you’re unlikely to reach this point in less than two hours and a rather big part of that time is going to be spend in the manual looking up how cards work. Contracts, buildings and employees all have icons indicating their function, but many of them are rather complex and the icons can’t convey all the details you need. Once you learned the cards, they do a good job helping your memory, but expect to consult the manual on your second and third game as well. You will also spend some time on maintenance in Prêt-à-Porter: you need to adjust your maintenance cost marker, actually pay the maintenance each month, acquire material cubes and change money bills many times. Also, did you notice how often I used the word “counter” in this review? That’s not a coincidence: there is many of them, and they get moved around. And then there’s all those cards that let you perform an action without having a pawn there that you need to remember. All of the above are small things, but they do add up and I think it’s fair to say that Prêt-à-Porter can be quite fiddly. On the other hand, all of these elements have a reason to be in the game. The maintenance costs mirror a real company’s expenses and make the decision when and who to hire or what building to buy more difficult. All the different counters are needed for the different preferences of the fashion show judges. 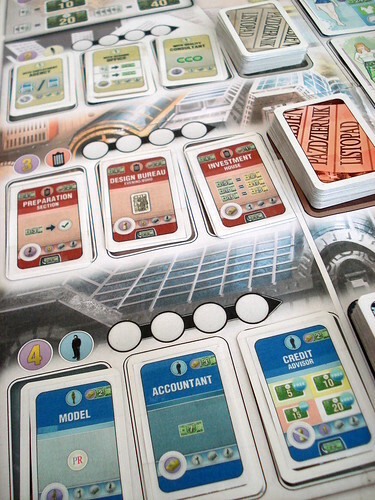 And the complex workings of the cards are annoying at first, but once you know their functions – and have an idea which cards exist in the game – you will realise that they are the heart of Prêt-à-Porter: choosing the right contracts, buildings and employees to optimise your company is the big challenge here, and with the wide variety in cards, when they come up and what the other players pick it’s a new challenge every time. Some cards appear very powerful at first – the Spokesman with his additional stars and the Investment House that lets you buy a higher company value come to mind here – but none of these cards is a guarantee to win, and if you let someone else get those cards together it’s your own fault. Having a good idea what your opponent’s cards are and watching which categories they are preparing for in the upcoming shows is the main sort of interaction in Prêt-à-Porter, by the way. You won’t be doing any direct trading here, but what your opponents do should have a big influence on your decisions. For that reason, playing in four people is more interesting than playing in two: you won’t be able to just find your niche, someone is sure to try for the same things that you do. 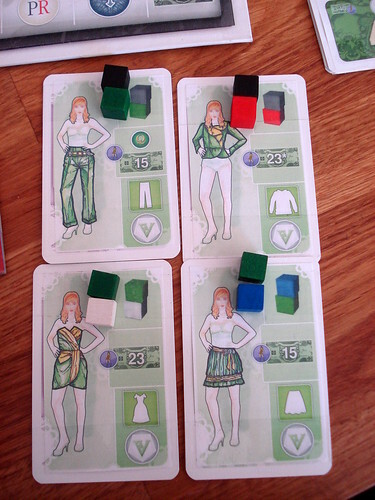 If you don’t mind fiddling with many components and the need to learn the cards before you play well and if you’re looking for a complex game with great replayability, then I’d advise you to add Prêt-à-Porter to your wish list. The English edition will be available in Essen and should hit your favourite game store afterwards. And don’t be put off by the theme, what you need to win here is not a good sense of fashion but the ability to optimise your cards. Despite what the title implies, 7 Wonders is not a civilisation building game but a very strategic card game that only reveals it’s depth after a few plays, and then some. Enough to win awards left, right and centre. And the best part? You can play in 30 minutes!